Ole Gunnar Solskjaer has reportedly told Marcus Rashford that he will be Manchester United’s main striker for the rest of the season. The Daily Star report that Solskjaer held talks with the England man during United’s warm-weather training in Dubai, where the interim boss ‘made it clear’ that he will replace Romelu Lukaku as the club’s spearhead. 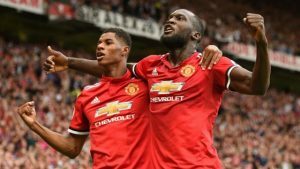 Former boss Jose Mourinho preferred playing Rashford out wide, where he split his playing time with Anthony Martial, which allowed Lukaku to play through the middle. But under Solskjaer the striker’s role is now Rashford’s to lose as the club legend puts his faith in a player that grew frustrated in the previous regime. The news will come as a blow to Lukaku, who was a £75m signing from Everton just last season. Lukaku averages a goal almost every other game for the Red Devils but he has struggled this season, only scoring eight league goals so far, and went nine games without a goal at one point. Unlike Martial, Rashford and Alexis Sanchez the Belgian is unsuited to playing wide attacking positions, and he now faces a spell on the bench. Meanwhile, Rashford has scored in three of the four games he’s played under Solskjaer and is almost certain to start against Tottenham Hotspur on Sunday.